We are a team of architects, architectural draftsman, and interior designer from Mumbai. After years of designing and detailing buildings of varied nature we felt the need for quality home plans and designs which can be useful to lot of plot owners from around the country (India) to build there family houses. For catering to the ever growing the requirement of house designing work we started with this online architectural consultancy and through this anybody who wants a ready to use home plan or wants to get custom designed home plan can get in touch with us. 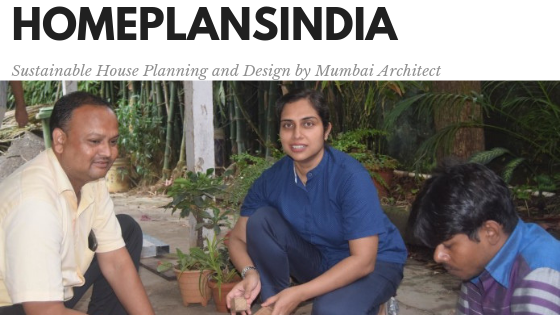 It doesn't matter if a plot owner is aware of architects or ever thought of an architect for designing there house, the idea is to make the complete process easy. This cohesive and quality thought process for each house plan will make it easy to build any dream home. We strongly feel that a house is just not a place of stay, but a space where events of life occur over generations. So to build a house where you will live for next 50 years or more of your life, it needs to has a futuristic vision. A house is planned as per the current needs of a family but it definitely needs to have a sincere thought about its growth and usage in future. Any plot owners invests his life savings to build the family house so as to make sure that the investment is done wisely. Getting professional assistance has always been considered as an expensive proposition, so here we would like to extend our support by making the designs with floor plans affordable and accessible to larger number of people. The designs have been developed by keeping in mind the requirements of any urban Indian nuclear or joint family. The plots sizes are something which varies from place to place but we have tried to develop as many possibilities as possible to cater to most of the usual plot sizes available all over India. These House Plans and Designs can also be used by plot owners in Pakistan, United Arab Emirates & Bangladesh, although the designs are architecturally processed and developed for Indian context but with few alterations they can work well all over the world. So do CHECK OUT HOME DESIGNS! The basis of this platform is also our personal keen interest in low cost and affordable housing for India. We are also trying to put in use low cost construction techniques as taught by Sir “Laurie Baker” and also CSEB & Rammed Earth Technologies which we understood from Satprem Maini, CSR, Auroville. Even though we are part of a big metropolitan city like Mumbai (and not a village) our learning from the masters have still kept our conscience clear to design and build for the love of it.